Jim was quite fond of looking at the work we did together as an investment in the future. The idea that we should leave the world a better place than we found it can be applied to all aspects of life. He simply felt it was his duty to help, and he did so happily. Peck grandparent Jim Rogers had a catch phrase: “Play me or trade me.” Put me to work, use me to my fullest potential, he meant, or send me somewhere where I can do just that. Jim was happy to be put to work on Peck’s behalf. He was, among many other roles, one of The Peck Promise Campaign’s two Grandparent Co-Chairs, and he passed away unexpectedly on December 17, 2018. He was grandfather to Sara ‘17, Teddy ‘18, Liza ‘21 and Maggie Rogers ‘23 (along with four other grandchildren, and one great-grandchild). Jim joined the campaign team in March 2018, jumping onboard enthusiastically to rally his fellow grandparents to support the campaign. 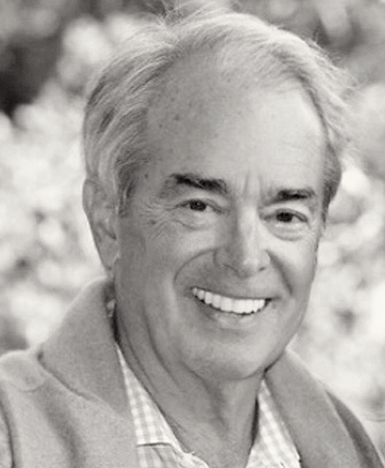 He happily lent Peck his time, his passion, and his vast fundraising expertise, as he felt strongly about investing in the future for his grandchildren and for future generations. Indeed, though Jim enjoyed a storied career as a lawyer and an energy executive, he also leaves behind a deep and lasting philanthropic legacy. He was chairman of Duke Energy, which gave him a uniquely informed perspective on climate change and drove his work toward developing renewable power sources. In 2015, he published a book, “Lighting the World,” which offered practical public and private solutions for addressing deep economic disparities and lifting the world’s poorest out of poverty. Jim’s focus on energy access for all and the teaching, mentoring, and activism that it inspired in him and others will reverberate for generations. As Global Vice Chair for The Nature Conservancy, he raised more than $5 billion dollars for issues like water conservation, land protection, and preserving natural resources. Jim was also a champion of the Charlotte, NC area, leading an $83-million campaign to revitalize the city with new museums. Jim and his wife M.A. made contributions at Queens University in Charlotte to fund the Rogers Health and Science Building, and Jim was instrumental in bringing the Democratic National Convention to the city in 2012. Jim measured himself by what he called “The Grandchildren’s Test,” asking himself, “Will my grandchildren be proud of what I did?” Jim remarked, “My hope is that they’ll say he played an important role in our future.” It’s clear that, through his remarkable work ethic, his deep commitment to philanthropy, and his joyous and warm personality, Jim passed this test with flying colors.